This easy beef stew can be made in either an Instant Pot or Slow-Cooker. 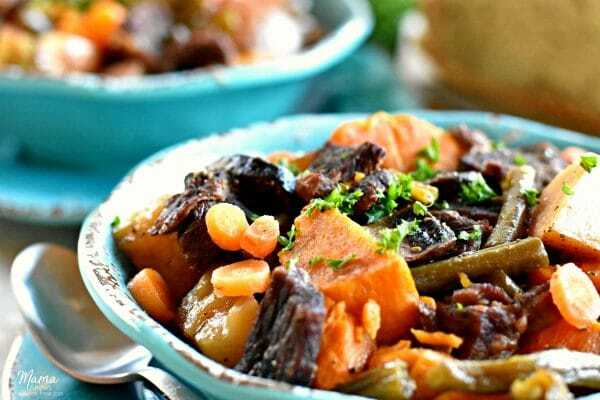 A hearty and savory beef stew with tender beef chunks and your favorite vegetables. A healthy and comforting meal that is gluten-free and dairy-free. It’s perfect for those following the Paleo, Auto-Immune Protocol or Whole30 diet. Beef stew has always been a family favorite recipe. 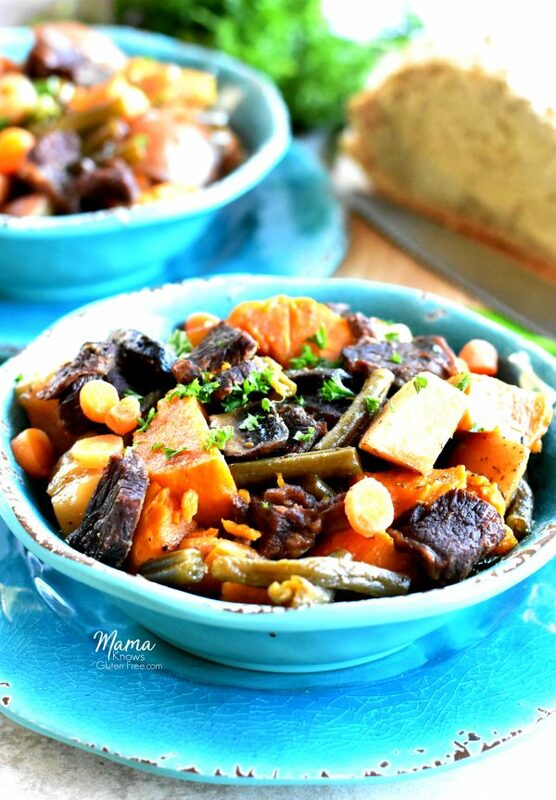 I have always made gluten-free beef stew in my slow-cooker. It’s an easy and hearty meal that is also healthy too. Beef stew is also easy to adjust the recipe according to your dietary needs. 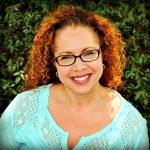 Last Spring my husband and I did the Auto-Immune Protocol diet to see if there were any other foods that we need to eliminate to help manage some of our health issues. 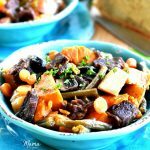 This beef stew was one of my go-to recipes because I could easily modify what types of vegetables I used in the stew. Nightshades are one of the food categories that you eliminate for 30 days, so I substituted peeled sweet potatoes in place of our red potatoes I normally used. I bought an Instant Pot during the Balck Friday sales. It has been a game changer for me! The Instant Pot really does cook things so much quicker. I also like the results I get from cooking in the Instant Pot. The taste and texture of the recipes I have tried have also been great when cooked in the Instant Pot. One of the first recipes I tried in my Instant Pot was my gluten-free beef stew. I could not believe how quickly the beef stew cooked. Also, the beef and vegetables were really tender and cooked perfectly. 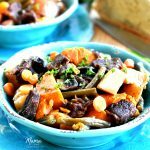 This savory beef stew is gluten-free and is perfect for those following Paleo, AIP or Whole30 diets. It is easily cooked in either an Instant Pot or a slow-cooker. This is a hearty comforting meal that your whole family will enjoy! Looking for other Paleo, AIP or Whole30 recipes? Check out these gluten-free dinner recipes. This easy beef stew can be made in either an Instant Pot or Slow-Cooker. A hearty and savory beef stew with tender beef chunks and your favorite vegetables. A healthy and comforting meal that is gluten-free and dairy-free. It's perfect for those following the Paleo, Auto-Immune Protocol or Whole30 diet. 1 tablespoon gluten-free Worcestershire Sauce I used Lea & Perrins. your favorite chopped vegetables I used mushrooms, carrots, celery, green beans, peeled sweet potatoes and red potatoes. Turn on Instant Pot to the saute function. Add olive oil to the Instant Pot. Add mushrooms to the Instant Pot and saute for a few minutes. Add the Worcestershire sauce and apple cider vinegar to the beef and mushroom and stir. Add all of the seasonings to a small bowl and stir to combine. Sprinkle the seasoning blend over the beef and mushrooms. Add chopped vegetables to the Instant Pot. 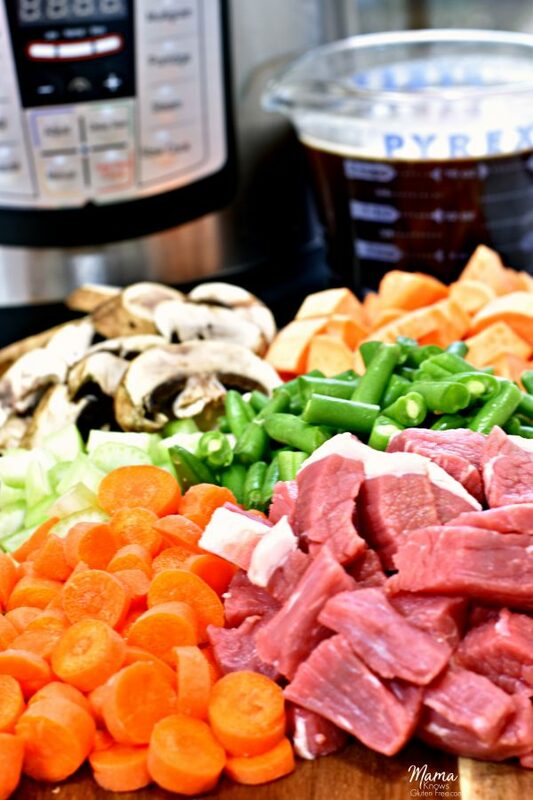 Pour gluten-free beef broth over the beef and vegetables and stir. Place the lid on the Instant Pot and turn the vent to sealing. Set on meat/stew for 35 minutes. Once the timer goes off, let the pressure release naturally for 10 minutes and then release the remaining pressure manually. You can also let all the pressure release naturally if you have time. Add olive oil to a large pan and brown the beef cubes. Salt beef to your liking. Add 1 tablespoon olive oil to slow-cooker and turn to high. Add browned beef to slow-cooker. Add mushrooms to pan and saute for a few minutes. Add sauteed mushroom to slow-cooker. Add chopped vegetables to the slow-cooker. Place lid on slow-cooker and cook on high for 4 hours or low for 8 hours. Audrey this looks amazing! I’m going to have to make this soon, I’m obsessed with my Instant Pot! Thank you so much Lauren! I’m obsessed with my Instant Pot too. I hope you enjoy it. I love my Instant Pot and I’m considering doing the Whole 30 in January. This will definitely be on my meal plan-SO good! Thank you so much Lane for the wonderful 5-star review! I love my Instant Pot too. It’s been a game changer for me. I hope you enjoy the beef stew! It’s a perfect easy meal for both the fall and winter. Just made this beef stew. Always looking for good gluten free recipes. Made in stand pot. Tasted AMAZING! So flavorful and satisfying! Thanks for the great recipe! Will add to my rotation! Thank you Beth so much for the wonderful 5-star recipe review! I am so happy that you enjoyed the beef stew. It’s one of my family’s favorite Fall and Winter meals. You are so welcome, I love sharing what I make for my family. Hi Lisa! You could add 1 cup to 2 cups each of our favorite veggies. I usually use 3-4 potatoes (depending on their size), green beans, carrots, mushrooms, and celery. You can use any veggies that you like. I hope you enjoy the beef stew! Are these herb amounts fresh or dried? Hi Kathleen! They are dried herbs. Thank you for asking and I hope you enjoy the beef stew. I’m excited to try this. It smelled amazing when I put it together. Hi Nadine! I hope you enjoyed the Beef Stew. You are absolutely correct about the Worcestershire sauce. You should always check your labels. I used Lea & Perrins and I added that recommendation to the recipe. Thanks!